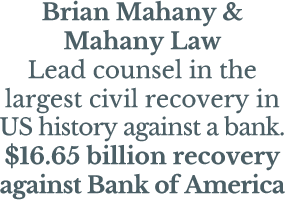 Brian Mahany is the managing partner and founder of MahanyLaw, a Fraud Recovery, Lender Liability, CMBS Litigation, Whistleblower (False Claims Act, SEC and IRS), and Legal & Accounting Malpractice law firm with a national footprint. Brian helps fraud victims recover their money in complex multi-state or international financial or investment frauds, assists people who report fraud against the U.S. government ("whistleblowers"), and helps people recover their losses from bad or fraudulent legal or accounting advice (legal and accounting malpractice). His clients have recovered (received) over $100 million dollars from major banks. 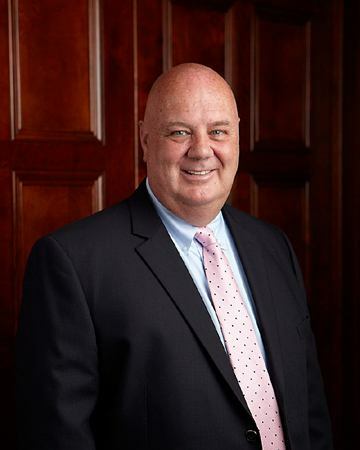 Brian is best known for serving as one of the lead plaintiff’s counsel in the recent $16.65 billion settlement against Bank of America, the largest civil recovery against a single defendant in the history of the United States. His practice philosophy is that every client is important: We return calls, treat everyone with respect, are transparent and equitable in our billing, and always outwork our opponents. We have had some remarkable outcomes you can see at my website BrianMahany.com and the firm’s website, MahanyLaw.com. Brian blogs regularly on financial chicanery, contributes articles to financial publications, and has a new book Saints, Sinners, & Heroes, Covert Ops in the War Against the C-Suite Mafia coming out in March. Brian also speaks frequently at financial and business events on topics ranging from lender liability to financial fraud and False Claims Act whistleblower cases. Often his cases and/or commentary appear in/on national media outlets, trade publications, and the financial press in the U.S. and abroad.